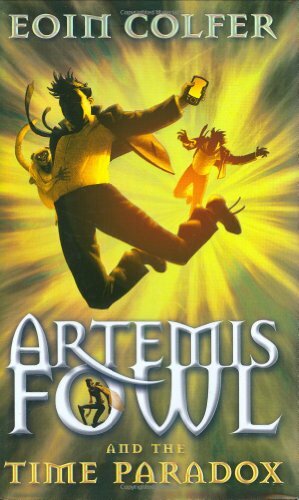 As with all of Eoin Colfer’s highly popular ‘Artemis Fowl’ books, this latest instalment has a wide-reaching ideas base that draws influence from myths and legends, hybridising these alongside technology and gadgetry. Humour here is rarely elevated above the ‘lavatory level’, but this in itself is effective in maintaining the recognisable stance and approach that the books’ core readership have come to appreciate. Having contracted a fairy disease, Artemis’ mother is critically ill at the start of the novel. This leads to the introduction of a slightly more humane and compassionate Artemis than the one with which readers are familiar. Endeavouring to save his mother necessitates travelling back in time to battle against his earlier self, so saving a silky sifaka lemur. This premise of Artemis constituting at once hero and anti-hero is a strong one with the potential to grapple with concepts central to ideas surrounding self-perception. Its efficacy, however, is diminished by a written style that is, at best, pedestrian, and by the fatal flaw that the willing suspension of belief that readers are indeed in the presence of a child-genius is rarely achieved by the wit or actions brought to bear by the central character. Fans of the series will delight in this latest instalment that offers resolve to over-arching questions concerning Holly. As is typified by previous books, however, a strong sense of the visual is beleaguered by unconvincing characterisation, plot-lines and dialogue. Antidote to this and a more genuinely exciting and engaging interplay with the ideas base and craftsmanship of Colfer’s writing can far better be found in The Airman.